Easter brings more newness and revival to me than any new year ever could. I love that as a believer I get to experience the anguish and sorrow of knowing that is was MY sin that put MY Jesus on the cross, and even though he didn’t have to, he stayed there for me. I am so thankful that I get to be brought back to my place of unrighteousness right at the feet of the One who is most righteous. I get to experience the sorrow of Good Friday with the added advantage of knowing that Sunday is COMING. I think I share this video every year via social media but the phrase ‘Sunday’s Coming’ has come to mean SO much to me. Obviously first it reminds me of the most glorious day in human history when our beloved Savior defeated the one thing every human considers so final and reminds us that with Him is does not end and absolutely nothing could hold him back from COMING BACK FOR US. Second, it has come to be a sort of kick in the pants. Sounds sillly but knowing that Sunday is coming during Easter has resonated with me when thinking about every other day in the year, years. Yes, Sunday came. And so will the day when Christ comes back even more victoriously than the first time. And it is my duty as a follower of Christ to go out and do everything I can to prepare everyone he has entrusted to me for the day of Christ. To make sure that every soul within my sight hears the Gospel and is told of the sacrifice, the cross, and the love so free given to them. It is one the enemy’s most tactful ways to hinder the harvest that is so ready. To make us feel like we have all the time in the world and to put off the one thing that absolutely MUST be done before we come face to face with our Creator. So, as we approach Friday and mourn our own sin but with the expectant knowledge that SUNDAY is coming, I encourage you to run passionately to do that is that God is asking or has been asking you to do. Every second of our time is precious to both God and Satan. Our Victor and our enemy know that ‘Sunday’ is coming. How would your life look differently if we lived like every second was being fought over for eternity’s sake? How would we see our world, our neighbors, even strangers differently? How would our priorities differ than they might be currently? The work is too great and the risk too high not to consider this. Please take 3 minutes and 39 seconds to watch this (CLICK HERE TO WATCH VIDEO) sometime this week. Let me know your thoughts! I’d love to have this conversation with you. 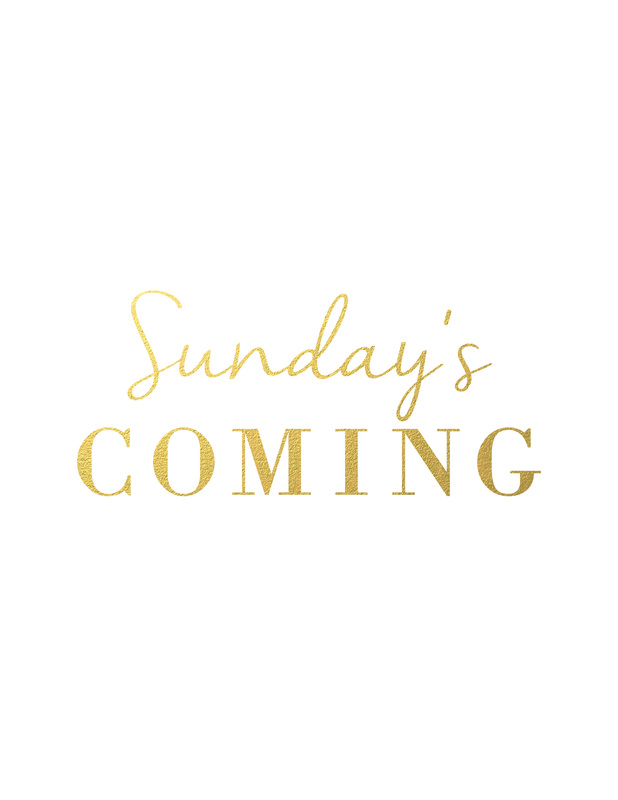 What does Sunday is Coming mean to you? I am so excited to begin our new weekly feature called Give Me Jesus with this particular Scripture. The intention of this segment is to share what God has been teaching me from my personal study time, raw and honest, straight from the overflow of my heart. And hopefully, you will share your thoughts or what God has been laying on your heart as well with everyone in the comment section! I love it when the online community gathers together to share encouragement and wisdom and wanted a spot to offer that here on the blog so please join in on the conversation! I so encourage you to grab your Bible and pour over these verses again and again these next few days. Anyone out there feeling the heaviness of this world lately? The darkness that seems so deep there is a struggle to remember that we are children of the light and the victory that comes with this sweet privilege? I ask these questions because both my hands have been up at one point or another lately. The Lord is so sweet to give us His words to remind us whose we are in times like these. The passage above is the one the Spirit led me to when I was feeling the weight of our temporary circumstances, and was so uplifted by the encouragement I knew someone else needed to hear it. The Lord MY God, YOUR God, OUR God is within our midst. HE IS HERE. His presence is tangible. He is not a God that is out of our reach. I feel like sometimes we forget that our God is ALIVE and his Spirit lives in us if we have a relationship with Him. This, I’ve come to realize is a trap from the enemy. What if we really believed we were in the presence of the one true Living God 24/7 and had full access to the same power that raised our beloved Savior? The short answer…A LOT of AWESOME things for the Kingdom would happen. The enemy does not want us to remember our power and the Presence that we walk in daily. Not only is my God ALIVE AND WITH ME, WITH YOU…he is the mighty one who WILL save. This part of the Scripture is so powerful if we will remember it. His word tell us he WILL save us, no matter how bleak things may seem and ‘His every word proves TRUE.’ There are tons of things that can change in the blink of an eye in this world but there is one thing that does not. And that friends, is that is that GOD WINS. And if we choose Him to be our life while we have ours, then that means we win too. The darkest evil cannot compete with the tiniest bit of Jesus you have in your heart because thats how great and powerful HE is. This is also something Satan would choose us not to remember. That at the very mention of the name JESUS he and his demons flee (James 2:19) because that’s how great and powerful HE is. That’s how powerful His NAME is. He is not TOO BUSY with the things seen or unseen to wrap his arms around his children and comfort our fears by His LOVE. His tangible presence that carries his LOVE to us. The love of our Savior is in our midst right now, friends. What are your thoughts on living life in the midst of the Creator? Is this something you struggle to remember or does this come naturally to you in your day to day life? I’d love to hear your perspective! Be blessed and stand firm in the faith, dear friends.